Brothers of Elvin E. Helms Lodge No. 926 observed St. John the Baptist Day and were welcomed at Petersburg Christian Church. Following the service a dinner was served for those attending. 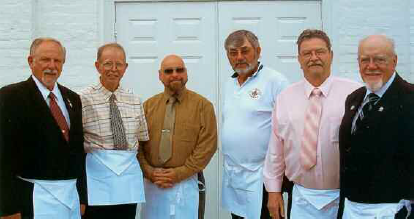 Pictured, left to right: Edward Tanner, Ernest Stratton, Travis Bush, Rick Campbell, Buddy Wallace, and Garry Kelly. Pastor Doug Newhouse chose as his text Amos 7:7-8, a passage that should be familiar to all Masons.